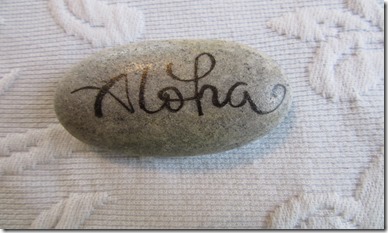 "Thank you for the Aloha Rock! I found this on a bridge rail on the road to Hana on May 3, 2015. When I first saw it I thought this is cool but I did feel a little funny wanting to take it home with me. I am so glad I turned it over and saw the message It’s yours. My husband and I were in Hawaii for our fifth wedding anniversary and had been on the road to Hana five years ago on our honeymoon. This is a really neat project you developed and we appreciate the extra souvenir! Thank you again for the ray of sunshine in our day!"